In this chapter, I will teach you how to drive real quality traffic your blog, but remember, getting huge traffic is one thing, keeping your visitors is another thing, it’s better to have 500 unique loyal visitors than to have 10,000 hit and run visitors. The theme of this chapter looks simple, but it can lead to the most frustrating moments of your life as a blogger, yes, traffic!, traffic! !, traffic!! !, viral traffic, that's what every blogger wants, no blogger would want to sacrifice his time writing posts and maintaining his blog, only to check his visitors statistics and see just 50 visits in one full day, It’s really frustrating, Don’t worry, I will teach you the needful in this chapter. In most niche, you will be competing with hundreds of other big blogs for the attention of same few readers, to stand out, you’ll need to produce something truly exceptional and enticing. Recall that we discussed how to write a viral post in one of our previous chapters. I remember being asked this question one certain time, "Why do some bloggers get the lion’s share of attention, while others toil endlessly to write posts that virtually nobody will ever read? ", well, after this tutorial, you will be able to answer the question yourself. Now, let’s see the necessary steps to follow and the needed trick to apply in other to drive high natural traffic to your blog. This is the number one step, Content is king, I keep emphasizing this, as a blogger you have to love writing and sharing, most especially topics relating to your niche. You should be able to expand ideas and solve problems through writing. Blogging is all about hard work, dedication and sacrifices. La copy la paste can never make you a pro blogger. Search engines are the main source of traffic for most blogs, and search engines don't index empty pages, they index posts and keywords which must be found in your blog. Therefore you should post at least 4 times a week depending on your niche, of course you should know that news blogs requires daily posting. We have already learnt how to practice posting using blognigeria.com.ng, you should practice how to post articles with blognigeria before creating your own blog, so you don't mess things up. In case you have not heard, Google loves lengthy posts, though it should be lengthy and meaningful, about 500 - 1000 words would be great, but like I said, it all depends on your niche. Images makes post attractive, also targeted keywords should be added to the alt tag in images, these keywords are used by Google to index images and posts, video should also be used if available, Google owns YouTube, therefore embedding a tube video will be a plus to your SEO rank. SEO optimization will be the topic of chapter thirteen, but you should know that when SEO is done correctly, helps your SERP (search engine rank point). After Search engines comes social media when we talk of high traffic sources for your blog. Though some Blogging Platforms Such as Wordpress enables auto posting to social media, it is very important that you share and re-share your posts on social media. Don’t just share it once, not everybody will be online when you first shared. Also note that the best time share on social media is evening during workdays and any time during weekends and holidays. Don't kill your time trying to make sense in all social media platforms, know the ones that works best for you. If your posts contains mostly videos, YouTube will be good for you, if it contains mostly images try instagram and pinterest, for text posts; Facebook, tumblr, and twitter will be great. Note that all these are just speculations, you have to try them out yourself to know the efficient ones. You should add social Share buttons at the end of your posts, this will enable excited reader to share your posts to friends, and this is another good way of making use of social media. This is another sure way of getting traffic to your site, set up a promo contest once in a while, give gift cards and free services to your most loyal members and they will spread the good news. Offer newsletter services to your visitors, not all of them will keep visiting your blog to check if you have added new posts, so it’s good to send them weekly or monthly newsletters in the form of mass mail in other to remind them that you have added new posts. Talk to your family and friends, tell them about your blog, bug them to comment and rate your posts, if you have good buddies, they will help in promoting your blog. Your visitors aren't going to wait around for your blog to load. If your page isn't coming up fast enough, they’ll hit the back button and move on to the next Google listing (i.e. your competitor). If your Blogging PlatformEnables the use of plugins, be sure not to overload your website with irrelevant plugins. Also, choosing a light theme or template will help boost your site speed. This is advisable when you have a product or service to sell, it's not that necessary for regular bloggers, but if you have the cash to flex, you can spend it a little of it on Adwords, Adchoice and other traffic sales company. You might consider enabling guest posting for your blog, invite contributors from other great blogs to write for you, (though most times it requires payment), Guest posts adds quality content to your blog which you might not be able to write on your own. In addition, the guest might also share his post, that's another traffic for you. This is the 2nd most effective method of getting free traffic (i.e. after writing quality content). Posting in a popular blog just like blognigeria.com.ng or nairaland.com and adding your website link to the post is one big way of getting targeted visitors to your blog (but don't spam by posting too many links, else you might be banned). 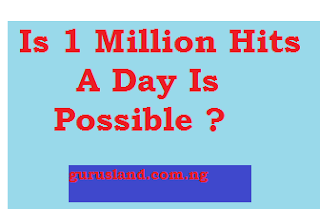 Yes, Posting At Blognigeria, this was how i increased ngstudents.com daily views from 500 visits per day to 7000 visits per day in one month. I wrote school articles at blognigeria and added my website link to my profile, I also answered their questions and referred them to my website for further help. It’s good to know blognigeria allows guest posting, not all blogs do, so this is another great way of driving visitors to your blog. In General, the possible ways of Sending real traffic to your blog can summarized in two sentences. 1. Write and share your Quality posts. 2. Invite others to write and share. If you have followed all these instructions and still do not get the expected traffic for your blog, relax it takes time gain grounds amidst other older blogs in your niche, just continue doing what should be done; post great articles! . And One day you will wake up to say, Hey! Google just remembered me!